Castlevania III returns to its roots and is an action platformer. Unlike the original, the game isn’t entirely linear, giving you branching paths along your way. Of the game’s 15 levels, you will play 9-10 of them depending on your decisions, eventually making your way to Dracula. 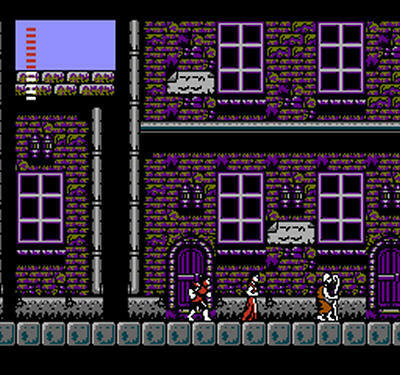 As one of the later games on the NES, Castlevania III: Dracula’s Curse is surrounded by technical mastery. In fact, it utilizes such an expansive amount of supplemental hardware (ie: chips) that the Japanese version isn’t even capable of working with the NES (unless you modify it, of course) and the US version is incompatible with “famiclone” systems. For all that work, however, Castlevania III is a great title that impresses on all fronts. Back to the extra hardware – the memory management controller chip, version 5 (MMC5) allowed the game to be playable on the NES albeit at the cost of some of the impressive sounds and graphics in the Japanese version. This doesn’t mean it’s bad by any means, the game still looks and sounds better than a majority of games ever released on the console, it’s just that the Japanese version is a bit better thanks to the VRC6 microprocessor. Normally I don’t gush on video game soundtracks, because save for a select few I don’t really consider it a notable factor. This is one of those rare cases that I must say the game sounds amazing, in any form. 1up’s own Jeremy Parish captured the difference in a YouTube video that I have provided below so you can hear the difference for yourself. 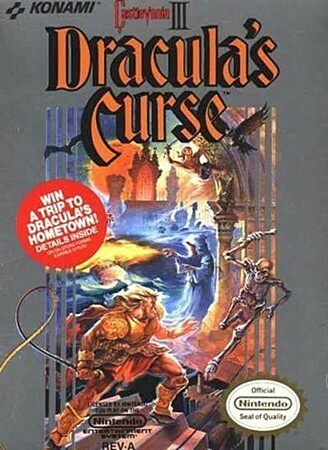 Control Simon Belmont through an open world and collect the five scattered body parts of Dracula and a magical cross. Once all of these items have been discovered, Simon returns to Dracula’s castle and assembles the parts to fight and kill Dracula, who has put a curse on Belmont. Depending on how fast you can complete the game, you will be given one of three endings. 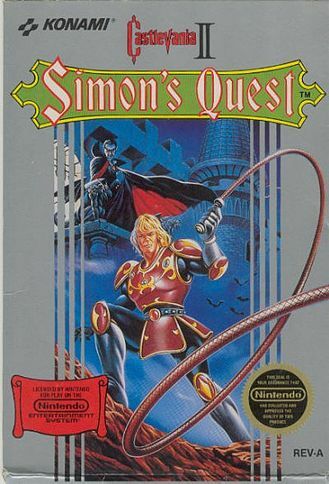 In Konami’s follow-up to Castlevania, the developer attempts to refine the game mechanics and make the sequel quite different from the original, as many NES games at the time were doing, with RPG elements. Simon Belmont can level up, purchase upgrades and weapons from townspeople, and freely explore an open world. The gameplay of fighting enemies remains mostly the same, however with the new open world format there is little direction as to where to go but blocked paths and out of reach ledges due to not having the right item streamlines it into a somewhat linear experience. In addition, day and night cycles keep the player on their toes as night time removes the safety of villages and doubles the strength of enemies. At face value the concept of this game was great, but there are some big issues that prevented us from enjoying it then and now. Few titles that started life on the NES still exist today. Of those titles there are even fewer that weren’t developed by Nintendo. Konami is one of the few companies that has a list of titles like this, although many of them suffer from very few updates and recent iterations such as the Metal Gear (Solid) series and Gradius. Castlevania does not have this problem. In fact, it still seems to withstand the test of time and despite trying to reinvent itself so many times, celebrates at least mild success with each new iteration. As a gamer who got his first console, an NES, in 1988, I have literally grown up alongside the series and played most titles it has to offer. If you don’t know Castlevania or have never played a single game, this will hopefully explain why you need to.